These days I feel people associate pain or chronic pain with the “opioid epidemic” we hear so much about in our daily news. It has reached such a pinnacle that Michael Bloomberg announced a $50 million donation to help fight it. But let’s not stereotype all of those suffering in pain with a drug problem that is gripping the nation. Elliot Krane talks about how our “nervous system develops feedback loops and pain becomes a terrifying disease in itself.” And while most doctors prescribe medication to treat the symptom of chronic pain, he is trying to get to the root of the pain so he can treat the cause. Hear, hear! This is what I have been saying! You can see from the above list that pain takes many forms. While some of the above conditions are temporary or relievable, some like fibromyalgia are chronic conditions. And not all of these painful conditions are necessarily visible. You can’t always tell from looking at someone on the outside how they are feeling. Invisible illness and chronic pain are very real. And sometimes those suffering don’t want others to know how they are feeling, so they hide their pain. They put on a happy face and go about their day, suffering silently. So my best advice is to just show kindness and compassion to everyone, because you really have no idea what may be hidden behind someone’s happy facade. I am the face of chronic pain and fibromyalgia. 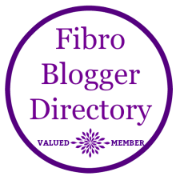 For more brave warriors and faces of fibromyalgia, please visit Fibro Blogger Directory and read about others trying to Shine a Light on Fibro. Thank you!! I wish the same for you. Yes the chronic pain from fibromyalgia and my back/neck issues can be unbearable at times. At least most of the others were resolved or short-lives! Hugs! I’ve had 8 too Cynthia, living with FM & osteoarthritis in several areas of my body on a daily basis now. But still smiling & yes often get the statement ” you look great!” Mmmm!